Details: Vergeboard and carved finials in gable eaves; shallow shed roofs over second story windows; window trim. Significance: Home of Frances Willard, leader of the Women's Christian Temperance Union until her death in 1898. The House's north addition would later become the Union's headquarters and museum in 1900. 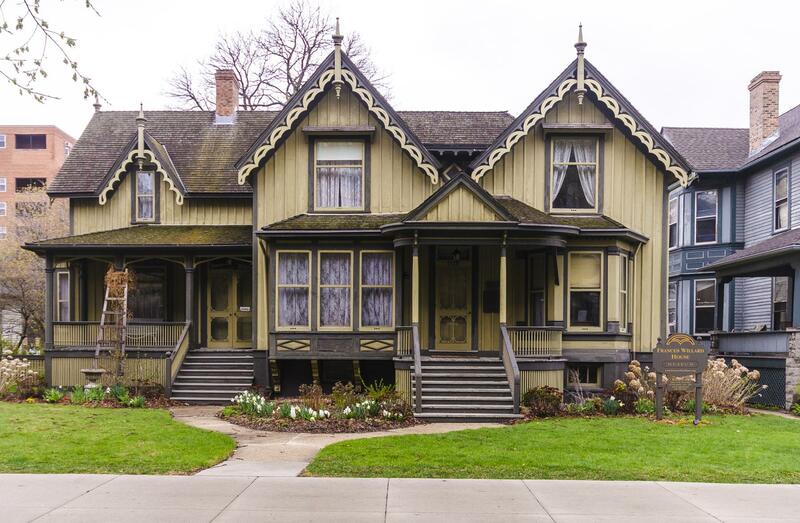 Historic Features: Multiple gables with vergeboard; finials; entry porch with gable; side porch with spindle work; window bays on east and south elevations; board and batten construction- typical features of Carpenter Gothic. Alterations: Roof material includes simulated slate, not original to the house. Exterior Alteration Permits: BP#2294, 1904.12.23, 1-sty frame addtn 17'x16'x16' $200. carpnt A. Bartlett; BP#2977, 1907.04.25, 1-sty frame addtn 12'x12'x14' $150. ; BP#2981, 1907.04.29, 1-sty frame addtn in rear 12'x12'x14' $150. ; BP#8831, 1920.12.27, 2-sty brick addtn 60'x44'x43' $35,000. archt Chas. R. Ayers; BP#23075, 1940.07.02, 2-sty brick addtn to hdqrts bldg (library) $12,000. archt Earl Reed; BP#26674, 1949.09.20, frame house improv new foundation; BP#34936, 1960.09.14, exterior iron fire escape 2nd fl to grade $2,050. ; 11MSWK-0125: Rebuild chimney and repoint parapet and dormer; 11ROOF-0380: Tuckpoint chminey. COA Info: 14PRES-0070: Install sign in front of property (front yard) describing Frances Willard and WCTU Historic District; 11PRES-0221: Rebuild chimney, repoint parapet wall and dormer; 11PRES-0213: Rebuild chimney using new press brick as needed, repoint with type 'N' mortar to match original mortar and joint finish as the original; 08HIS0000000046: Install sign on front yard (same as 08HIS-00000-00033); 01HIS0000000175: Remove slate roofing material, replace it with simulated slate shingles. Historic Info: Home named "Rest Cottage" by resident Frances E. Willard "because she found it to be a real haven of rest." blt 1865, orig 6 rooms, rooms added for Oliver Willard's widow and four children. National WCTU offices moved into north section (now museum?) after Miss Willard's death in 1898. National Headquarters blt in 1910, main part of bldg completed in 1922 to provide offices, in 1940 Frances E. Willard Memorial Library was added. Evanston Landmark. 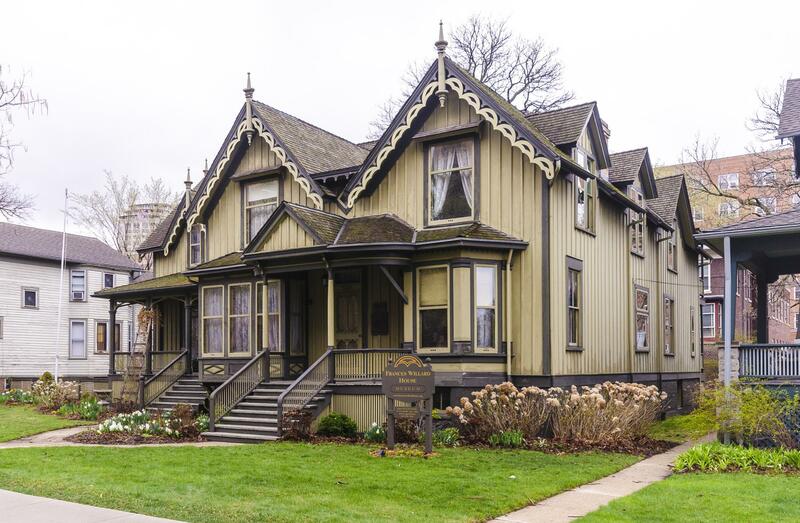 Statement of Significance "This Victorian Gothic cottage is one of two examples of a formerly common building type in Evanston to survive complete with its board and batten siding..."